The back of each setting is open and they are positioned so that light reflects off the main piece and out through the moonstones to really enhance the soft sometimes-white, sometimes-blue colour and clarity of the stones. The photo opposite is a close-up of the pendant from this set. 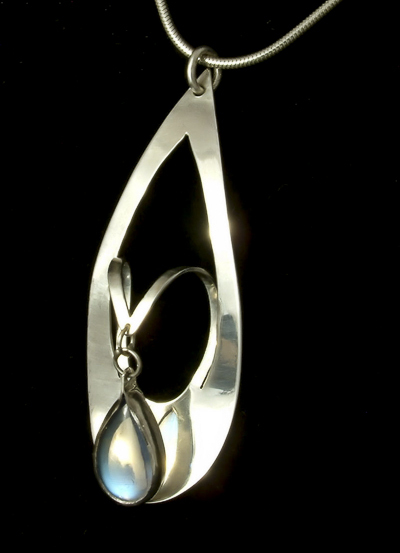 See how the reflected light shimmers though the moonstone. I was able to buy some particularly good quality moonstones, so I created a design around them to show them to best effect. The stones' settings hang from the main body of the pendant or ear ring bringing delightful shimmering movement to each piece - especially the ear-rings.